Lockheed Martin subsidiary Sikorsky has initiated a two-month tour around Latin America to showcase the aerial firefighting capability integrated on its Black Hawk helicopter to existing and future customers in the region. Lockheed Martin said Wednesday Sikorsky’s Firehawk Aerial Firefighting Mission Package includes a 3,785-liter water tank and an extended main landing gear, as well as a rescue hoist and medically-configured interior set as options. The set can be used for older Black Hawk models such as the UH-60L and S-70A, and for newer models such as the UH-60M, S-70M and S-70i. 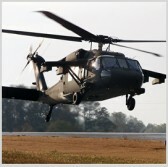 Sikorsky has been delivering Black Hawk helicopters to the militaries and governments in Latin America for over 30 years. “Latin America is increasingly susceptible to wildfires that threaten lives and property, and the firefighting season also is shown to be lengthening,” Adam Schierholz, vice president and regional sales executive for Latin America at Sikorsky, said. Schierholz added the aerial firefighting package has previously helped the Black Hawk aircraft extinguish wildland fires along with firefighters attacking the same area from the ground in California. Sikorsky will present the Black Hawk aerial firefighting capability with United Rotorcraft in Chile, Ecuador, Colombia, Brazil, Argentina and Peru.